There are many interesting places to visit that are a short drive from Arabi. If you can stay for a few days, you will find so much to do that you will need to plan a return trip just to fit everything in! Stay in Arabi and enjoy our wide, full hook-up, pull-thru sites with fewer crowds and clean facilities while driving to your events. Perry is only 43 miles north on I-75. 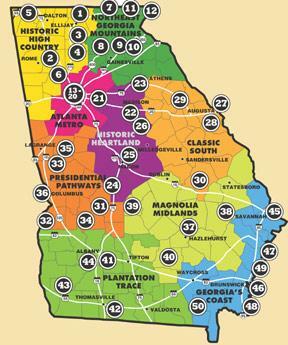 We are an easy drive to most of Georgia Magazine's "50 Must-See Places". Stay here at Southern Gates RV Park and enjoy the sights without having to set up and disconnect every day. Head out and see History, Natural Grandeur, and High Technology but return "home" every night! Click on the Map above to find your adventure!